Pattern Description: Misses' pull-on slim/full skirts, pants, and raglan-sleeve top. A Just4Knits pattern. Pattern Sizing: Size A (6-16) I used size 16 as a base and added width to the side seams to match those of a size 20. Were the instructions easy to follow? Extremely, as there's not that much to them. What did you particularly like or dislike about the pattern? 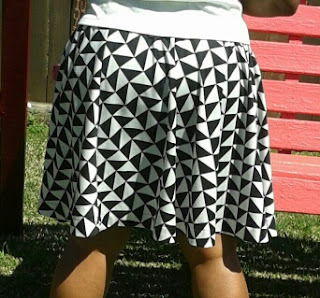 The simple ease of this view; this is basic skirt construction. Pattern alterations or any design changes you made: I thought that because I had gained two sizes since last using this pattern, I had to add some width. I ended up adding 3" total, which was actually an inch more than I needed. 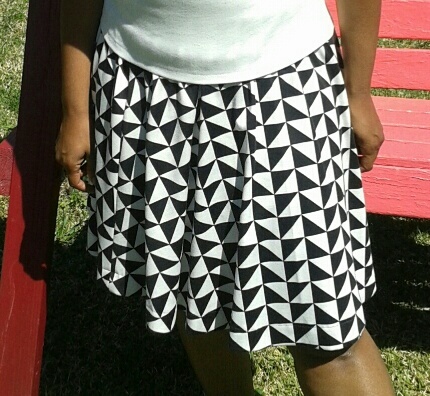 I reused the waistband pattern piece for Simplicity 1163 knowing that it fit my current measurements. I also cut the skirt out halfway between the two lengths, so it is 3" longer than view C and gave it a 1-1/4" hem. Would you sew it again? Would you recommend it to others? 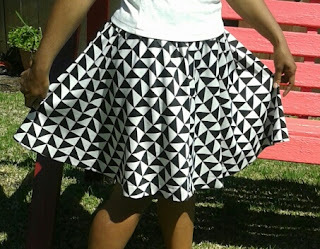 I've now made both skirts in this pattern and made the top three separate times, so yes, I would recommend this pattern. Conclusion: This skirt might seem familiar. I had to replace this skirt when the fabric pilled horribly and discolored over time. Not surprising as I bought it on sale ($1.99 per yard!) and this same fabric keeps going on sale. I had more of this fabric because I originally meant to make a matching top but decided against having my entire body covered in this very loud design. I know it won't last for a long time but I'll enjoy it while it does!